At SOS Survival Products, Inc., we stand behind the quality of our products and we make things right if you are not satisfied with your purchase. Our shipments are carefully inspected before leaving our warehouse, but in the event you are not satisfied with your purchase simply follow the instructions below. SOS Survival Products will process returns and refunds only for items that were purchased directly from sosproducts.com within the last 15 days. If you need to return an item please see our Return Guidelines below to ensure proper processing. Failure to follow these guidelines may result in a delay processing your return and affect your ability to receive a refund. Once your return is received by SOS: Pending inspection, a refund or credit for the full purchase price (plus tax, excluding outbound shipping cost) will be issued to the credit card used to purchase the item(s) you are returning. 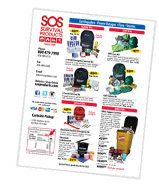 You are responsible for the cost of returning the item(s) to SOS Survival Products, Inc. unless the return is a result of our error or defective. We will notify you via email of your refund. Shipping and handling charges are non-refundable. a. To receive authorization for a return you must contact customer service at: 800-479-7998. The Return Goods Authorization Number (RGA#) will be given to you. d. If you are returning merchandise shipped via trucking company, please call us at 800-479-7998 for shipping instructions. Our return center cannot process exchanges. If you've found another item on our website you would prefer, please place a separate order for the new item and return the unwanted one under the terms of our Return Policy.